Today I have a plethora of owls for you! 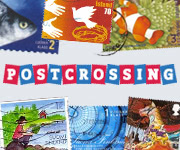 These two cards both come from Postcrossing forum member lumileopardi in Finland. They show the great horned owl, Bubo virginianus, another North American owl. This owl card comes from Kelly1989 on the Postcrossing forum. The card shows the White-Faced Owl, an owl native to Africa. This card comes from the Netherlands. Here is a snowy owl from Martuchaa in Poland. And finally, this card came as an official Postcrossing card from Taiwan. I am not sure what species this owl is, because the card doesn’t say. And the stamps from Taiwan.